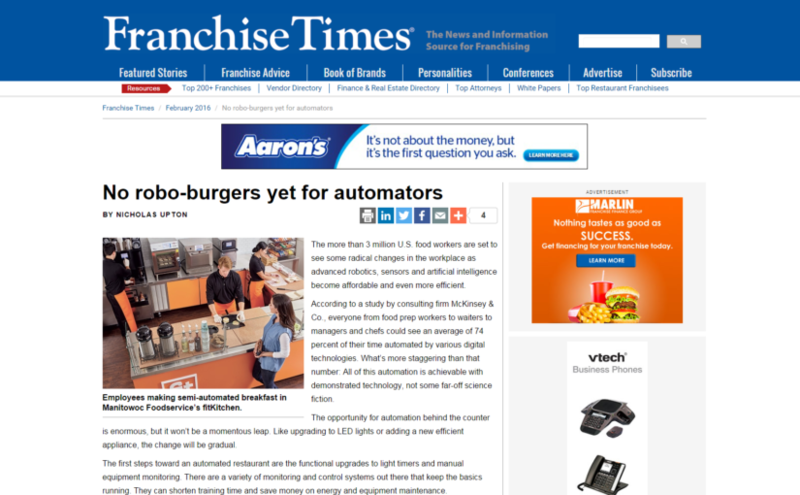 As franchise owners look toward the future uses of Technology in the kitchen, Nicholas Upton took a look into the present with a glimpse into the future on Franchise Times online. We here at Restaurant Technologies are proud of our automation process, reducing risk, increasing productivity, and truly making Safer, Smarter Kitchens. Saving run time, of course, means less maintenance through the life of that fryer or broiler. And sensors can alert operators and managers before a piece of equipment fails to avoid costly outages or spoilage. A Restaurant Technologies Inc. product takes the labor out of changing fryer oil. Kevin Schlutz, president of Central Iowa KFC Inc., is a fan of efficiency by way of automation. He’s recently upgraded to web-based thermostats and a new equipment-monitoring package. But it was an integrated oil-management system in the company’s 15 restaurants that gave him peace of mind. The system consists of two tanks, a fresh-oil tank and a waste-oil tank, both monitored by sensors. As they draw fresh shortening, they dump it into the waste tank via lines connected to the fryer. Aside from happy, safe workers, the fact that oil isn’t splashing around has saved significant time on cleaning.